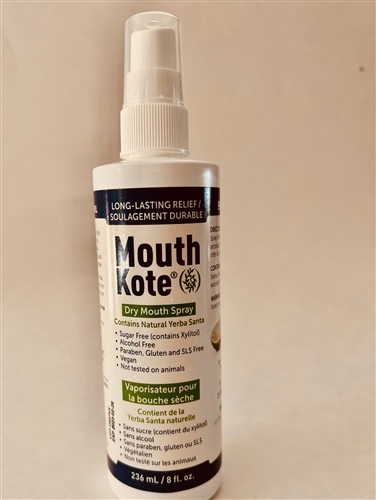 Mouth Kote® is the first and only dry mouth (xerostomia) product containing Yerba Santa which is an indigenous plant to the Northwest and has been used by Native American Tribes for many generations. Yerba Santa restores topical moisture to oral tissues, and safely delivers a natural lubrication to the mouth, and decreases the discomforts often associated with xerostomia. MouthKote® contains xylitol, has no sugar or alcohol, and has a pleasant lemon-lime flavor. 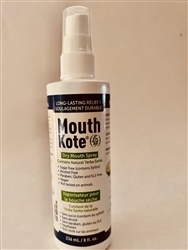 MouthKote® relieves dry mouth conditions caused by many medications, radiation treatment, Sjögrens Disease, and aging. It is also used by many professional vocalists and performing artists to eliminate or reduce their dry mouth and dry throat conditions.